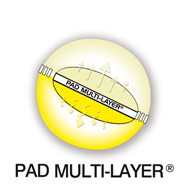 PAD MULTI-LAYER® Is a patent pending technology allowing to avoid any interaction between active ingredients in the fast and the slow release layers in a MULTILAYER® tablet. PAD MULTI-LAYER® guarantee stability and uniformity of the release up to the end of shelf life when is required a definite curve separation between the fast and slow release. PAD MULTI-LAYER® technology can be applied to finished products in MULTILAYER® tablets. Each Application of PAD MULTI-LAYER® on finished products is branded and could be protected by patents issued or pending.